The Keto Diet, when followed correctly, can bring about amazing change and positive benefits. Faster weight-loss… abundant energy… it’s a powerful idea. But this strict lifestyle requires a bit of work… HARD work, for some. It means avoiding sugar at almost all costs. 10 grams... that’s all the sugar you can have in a day. And that 10 grams adds up fast. Sugar is EVERYWHERE. Can you enjoy sweets and STILL undergo ketosis? 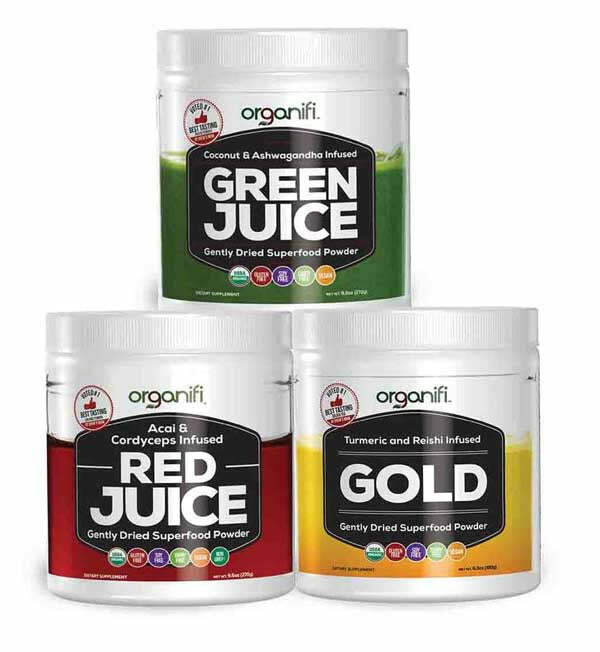 Thanks to the superfood ingredients that make up Organifi Green, Red, and Gold Juices, now you can! Remember: Even if you’re NOT on a keto diet, we could ALL benefit from less sugar in our lives. Organifi is here to help… from Sunrise to Sunset. These 3 drink mixes have become so popular in the health community and the public, Drew decided to put them all together into one big bundle – The Sunrise to Sunset Power Box. It’s a great way to save money - for long-time fans of Organifi and newcomers alike! Sounds great, right? So why isn’t EVERYONE doing this? Because it can be EXTREMELY difficult. Again, sugar is everywhere (even for those trying to go VEGAN KETO). Often, we don’t even realize how much sugar we encounter on a daily basis. And if you tip the scales beyond that 10 gram threshold, you sacrifice all the hard work and effort that went into it until that point. By delivering high-quality, 100% organic, keto-friendly superfoods in a delicious, sweet, low-carb, vegan, perfectly craveable juice mix… that’s as easy to make as it is to enjoy. Nutrition can nurture your body and mind in ways medicines still can’t.7 And the healing qualities of superfoods are simply mind-blowing! So why aren’t superfoods a part of everyone’s daily routine? For many people, importing these foods can get very expensive, and that doesn’t guarantee you’ll get the same, high quality nutrition every time. It’s also time-consuming. Assuming you have access to the right superfoods, that’s still just the beginning. You have to peel... slice... chop and dice... you need a high-quality juicer to extract the proper nutrition while holding back the fibrous solids... it’s a lot of commitment! It started with Organifi’s Classic Green Juice. This unique blend of 11 superfood ingredients focuses on honing your body’s ability to detoxify from environmental hazards, heavy metals, and poor nutrition. It contains a rare herb called ashwagandha, which has the amazing effect of lowering your cortisol levels by over 25%.8 With less stress, your body stores less fat. That fat doesn’t stick around – it gets burned for extra energy! Drew’s original Green Juice developed a stellar reputation fast. People from all walks of life love the way it makes them feel... and the flavor gets 5 star reviews! With a lemony zest and a hint of mint, this green juice is the farthest thing from most others on the market (which reviews say taste similar to grass and hedge clippings). 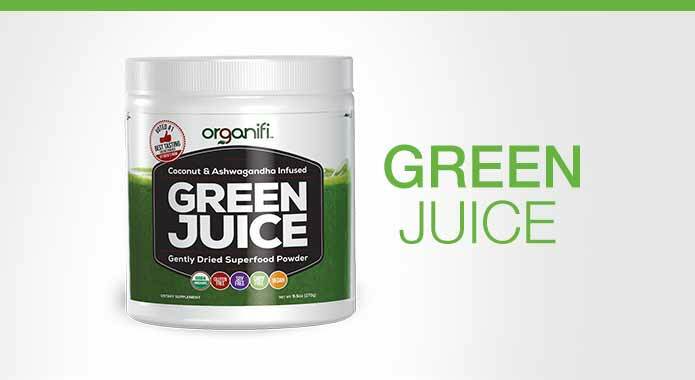 The success of Organifi Green Juice led Drew to wonder... what other superfood combinations could have the same kind of impact on the health of men and women everywhere? ? He started looking into the anti-aging properties of antioxidants. Fruits like acai berries, pomegranate, and blueberries. At the same time, he discovered metabolism-boosting ingredients used by Olympic champions from Europe and Asia – like rhodiola, cordyceps, and Siberian ginseng. 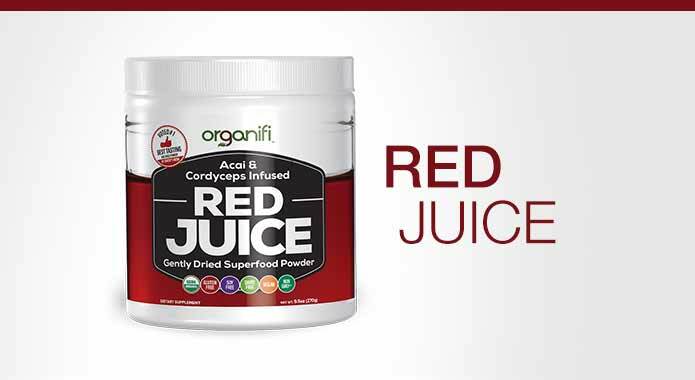 This led to the creation of the youth-enhancing powerhouse, Organifi Red Juice. This ruby-red berry punch has completely replaced coffee and energy drinks for many athletes and average Americans. It’s got a boost of power you feel with your first sip. And with a super-boosted metabolism, your body is getting the equivalent of a hard workout while you rest! Now with a glass of Green Juice in the morning and a Glass of Red Juice in the afternoon, Drew’s juicing routine was nearly complete. But what about nighttime? What could your body be doing while you sleep? Drew started looking into ingredients that attack the buildup of inflammation in our joints and muscles. He searched for ingredients that calm and soothe, providing the relaxation needed for deep, rejuvenating sleep. 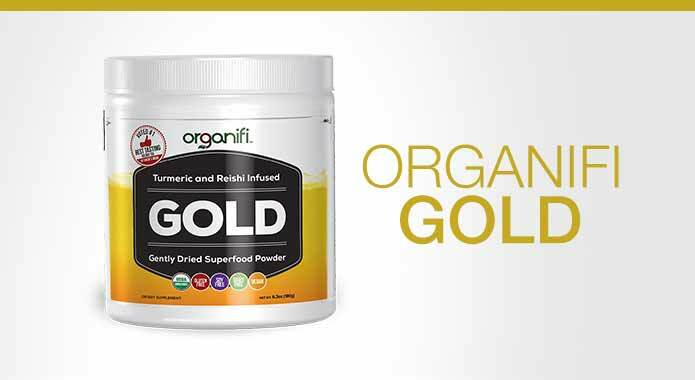 He discovered how ingredient	s like turmeric, ginger, lemon balm magnesium, and turkey tail mushroom work together... and with that, he created Organifi Gold. This amazing blend is prepared like a warm cup of tea or golden milk. And while you get some of the best sleep of your life, your body will still be working – detoxing, rebuilding and repairing. When you wake up refreshed and ready for the new day, you’ll know you’ve done it right. Q: Is Organifi REALLY the best-tasting health juice? Our team members (and thousands of customers around the world) certainly think so. Flavor is a big factor in creating our juices, because we know we won’t drink stuff that tastes bad. And this is your chance to find out! Try it for yourself and let us know what you think. I guarantee you’ll be pleasantly surprised at the sweet, refreshing taste. I am allergic to eggs, soy, nuts, wheat, dairy, gluten, yeast, etc. Can I take Organifi? Q: Why is Organifi a powder? Simply put, the powder helps you absorb as many of the nutrients as possible. That’s why most of a tablet or capsule just ends up as expensive urine! The other factor is CONVENIENCE – taking Organifi in capsule-form would require 16-18 capsules just to get one serving! Q: Are there any extra ingredients in Organifi I need to be aware of? Organifi is 100% free from preservatives… dairy… artificial flavors… MSG… artificial sweeteners… wheat… soy protein... we use only pure, organic, immunity-boosting goodness. Q: How often do I use Organifi? We recommend 1-2 servings per day. It depends on how fast you want to experience results!